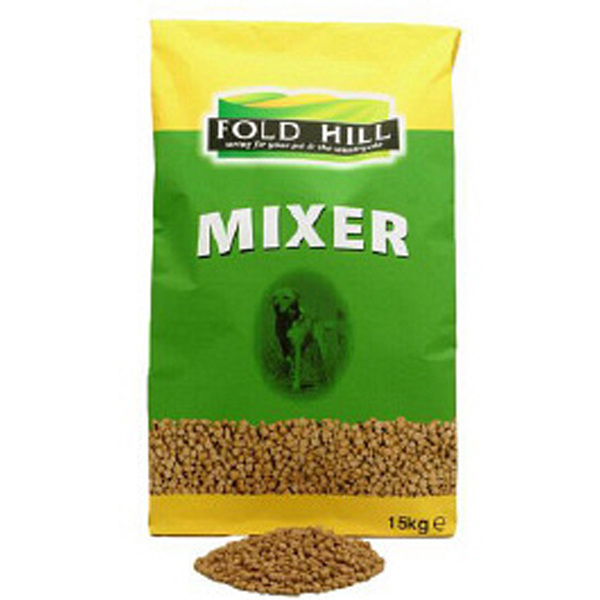 Fold Hill Mixers are a nutritionally balanced accompaniment feed, formulated to be fed alongside canned or fresh meat. The mixers consist of whole wheatmeal kibbles, enriched with calcium for oral and skeletal health and fibres to aid the digestive process. Added vitamins, minerals and oils will nourish and protect your dog from the inside out, helping to support their natural defenses and promote a healthy looking coat. Cereals, Oils And Fats, Minerals, Meat and Animal Derivatives. Protein 10.5%, Crude Fibre 2%, Fat Content 8%, Crude Ash 4.5%. Mix with an equal amount in weight of canned or fresh meat. Below are some recent questions we've received regarding Fold Hill Dog Biscuit Mixers, including answers from our team. Is the Fold Hill mini mixer suitable for dogs with mild pancreatitis. This mixer has a moderate fat content. It would be OK to use if the meaty part of the diet is not high in fat. Dogs prone to pancreatitis should not be over-fed (being slightly slim makes them less likely to get it) and the diet should not have a high fat content.